In the preschool years, children begin to develop a keen understanding of themselves and a heightened awareness of the world around them. It is the perfect time to foster nascent interests and skills that will last a lifetime. 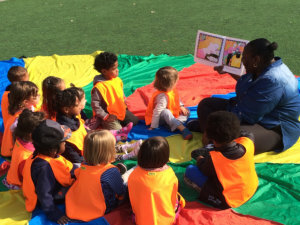 The Hanson Place Child Development Center program for preschoolers targets school readiness and the development of critical literacy skills. Reading readiness programs introduce the alphabet using letterforms, sounds, and words. Hands-on activities teach basic math and science concepts. Age-specific programs help children get ready for school. Themes encourage curiosity, self-direction, and persistence. Hands-on activities teach basic math and science concepts. Programs help children get ready for school. Themes encourage curiosity, self-direction, and persistence. Reading readiness programs introduce the alphabet using letterforms, sounds, and words.